We recently brought you the Lit-Lovers Guide to Bushwick on where to read, write and shop in the neighborhood. You may have noticed that several of the coffee spots mentioned are more than just cafés—they feature rotating works of art or moonlight as other venues. Read on to find out where you can see new art, bump into your favorite celeb, zen out through yoga or trade in lit for wit with a comedy show! I see new art hanging on the walls every time I grab my favorite iced Americano here. Since last October Express Yourself Barista Bar has been serving up coffee and events, engaging with artists and providing a venue for neighbors to work their craft. 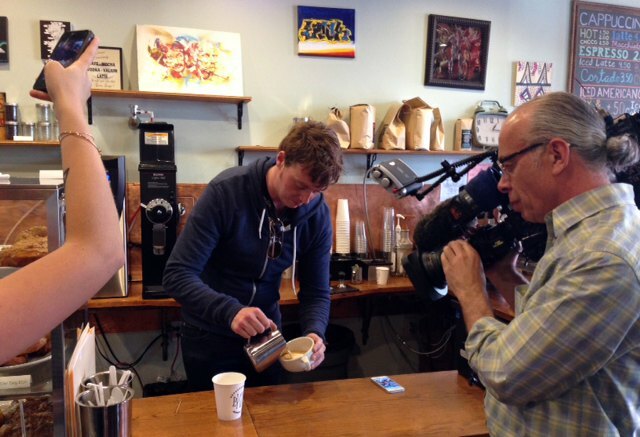 Local Barista Artist Michael Breach has filmed interviews about his latte portraits here as well. 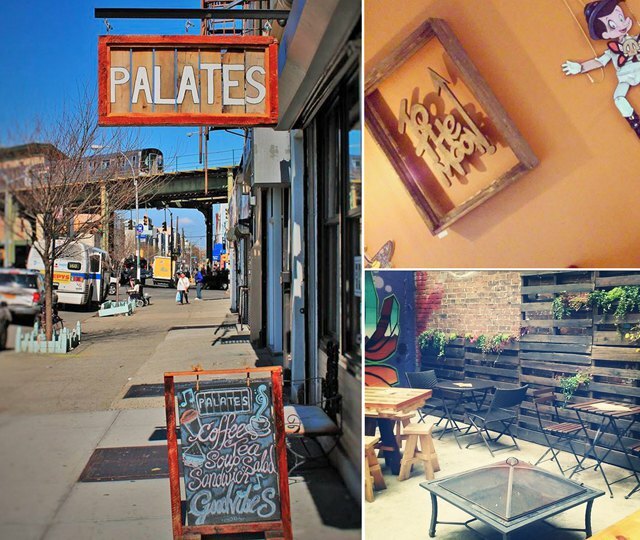 This venue has held poetry readings, meetings for the Northwest Bushwick Community Group, live music and more. On Friday, September 12th Express Yourself will host an opening reception for local artist Ogie Roks. This coffee shop/bar/event space provides a spot for the locals to experience their favorite bands, comedians, spiritual practices and inebriation all under one roof. The ladies (and gents) can stretch their limbs with weekly yoga classes like Ballet Barre or Baby & Me, or get their fill of burlesque, stand-up comedy and/or live music on any given day of the week here. Get your art and caffeine fix on the way to El Mio Cid or The Wheelhouse. A regular patron of the arts – The Coffee Shop Owner Michael Avila keeps his clients inspired with a new artist each month. The latest opening was on Saturday, September 6th by Erric Molloy of Percent Artworks featuring Erric’s custom-made bottle lamps which infuse his love for the neighborhood street art and up-cycled materials. We told you about their Wafflato (I have tried it and it is delish) which you can’t resist while checking out the newest display of local art amid the many wooden pallets inside Palates. A new art show is currently on display, curated by Street & Graffiti Art Curator Kevin Michael and the artist Gazoo—who’s spray paint lettering of ‘To The Moon’ is all over town. The group show “Cut It Out! !” features a piece by Love Child, who we caught during Apostrophe’s flash mob art show on the Kosciuszko J subway platform in August. 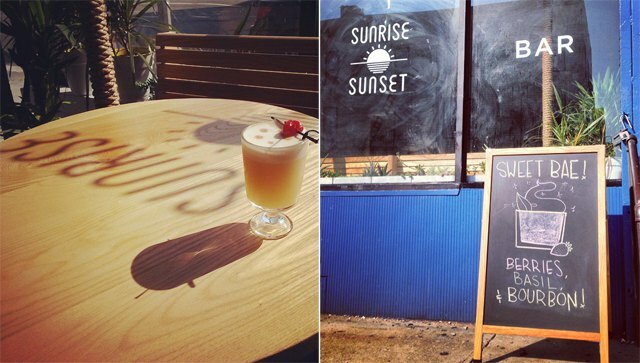 This spot provides coffee, smoothies, juices and art—healthy and artsy, WHY NOT!? Celebrities love it too! Ben Stiller was spotted here while filming When We Were Young (to be released in 2015) last fall. 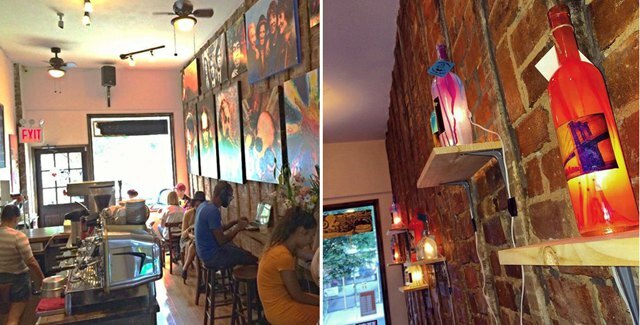 Earlier this summer, Owl Juice Pub featured artwork by Matta, "The Youngest Artist in Bushwick and you can stop by to see a new selection of works each month. 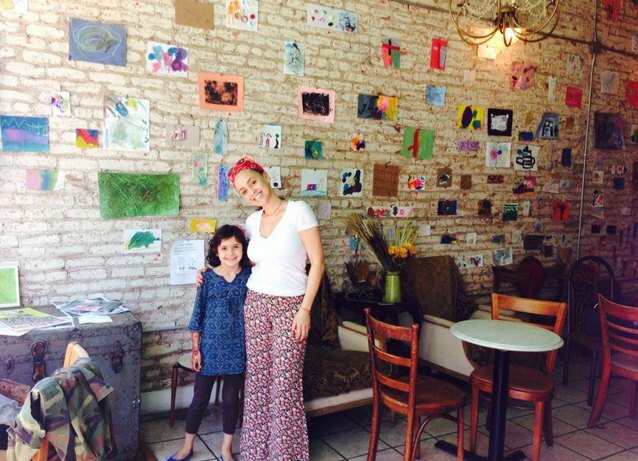 Owners Leticia Castillo and Carmen Valerio also operate Central Café where they feature local artists' work—local photographer Meer Musa has been showing there throughout the years. 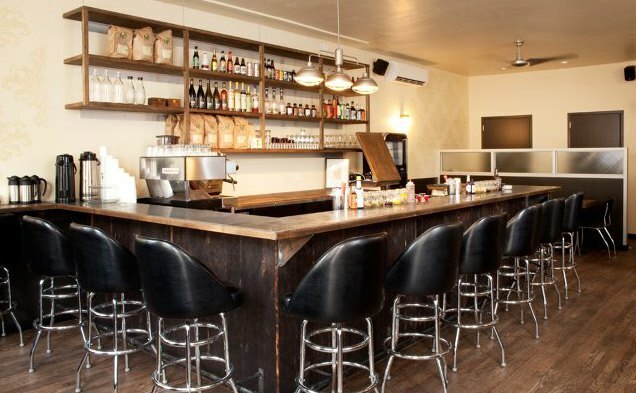 This new bar opened over on the corner of Evergreen and Bleecker in July, serving drinks in the evening and brunch on the weekend. The perfect place to 'wine' down on the way home from work, and just wait—they will soon be operating as a café on weekdays with coffee and breakfast. What do you think of this place – are you digging the wine and cocktail selection? The Ange Noir Café serves as a venue and performance space for local artists and musicians, and is running their "Super Coda" series on Thursdays at 8 pm beginning September 19th — inviting three acts to perform each week, featuring a sound artist, songwriter and performance artist. If you're thinking of joining, hone your vocals during their open mic night on Wednesdays at 7 pm. While there you are likely to see a new selection of artworks by your favorite artist friend or bump into your neighbor enjoying a coffee or pastry. They also serve beer and wine! 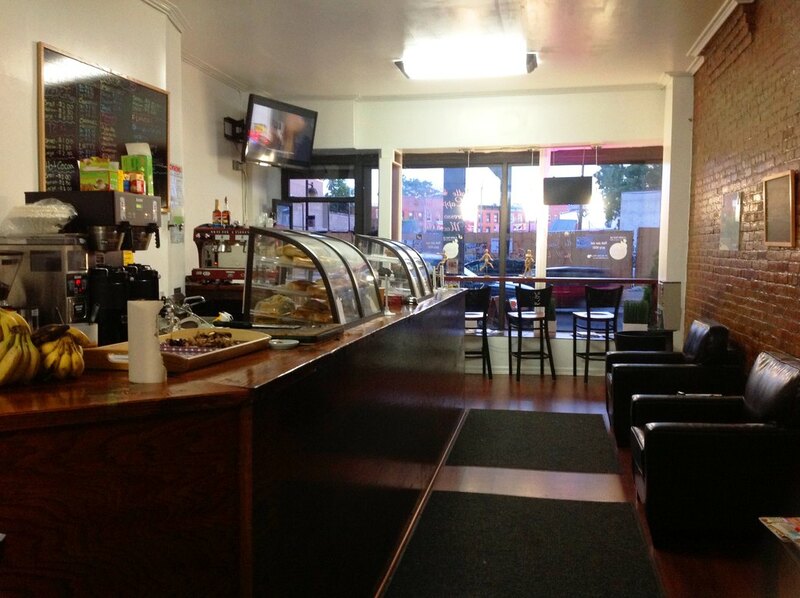 Little Skips – the place to go for yummy sandwiches, gluten-free snacks and chai beverage perfection. You can even make your drink dirty with a double shot of espresso. 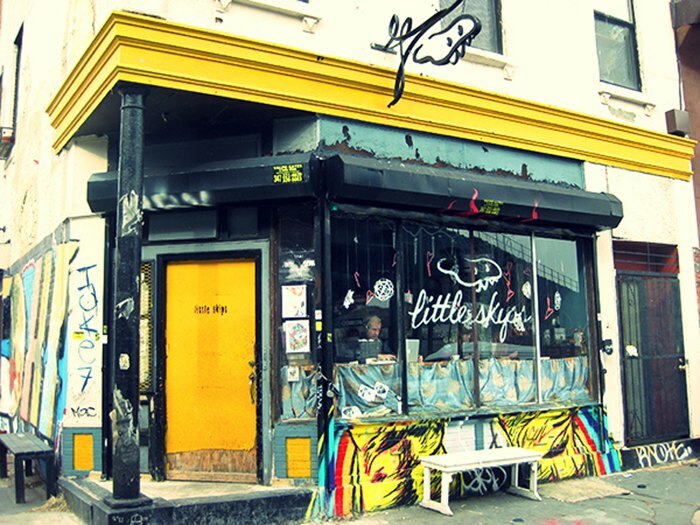 No stranger to the Bushwick art scene, Little Skips has served as a hub for Bushwick Open Studios events and you can catch rotating artworks along their walls.